Nyanang Shedrup Gaden Phelgye Ling Monastery was first established in 1689 by the 5th Dalai Lama. At that time the Dalai Lama constituted the monastery as a branch of the illustrious Sera Mey Monastery. The original Phelgye Ling Monastery was located inside the border of Tibet, very near its neighbor Nepal. The area of Nyanang, in Tibet, was also one of the 4 great hermitage places of Jetsun Milarepa. At the height of the monasterie’s population, there were about 150 monks. 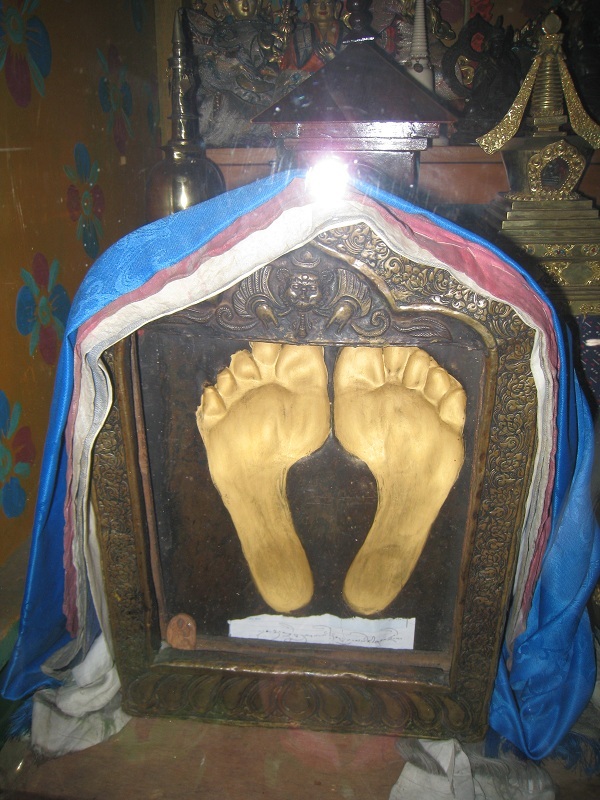 It was during the 1959 crisis with China that some of the monks fled to Nepal, taking many sacred items with them. After staying at various monasteries in Kathmandu for many years, a group of monks from the original Phelgye Ling finally decided to lay the foundations for the new monastery. This new Phelgye Ling was constructed in 1972 at the foot of Swayambhu Stupa. 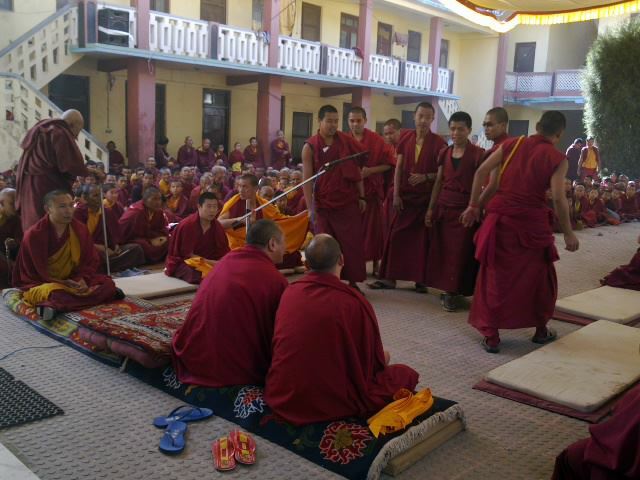 This first group of monks consisted of Gelong Pasang, Gelong Jampa, and Gelong Ukyen Kelsang. Gelong Pasang would serve as the first acting abbot while Gelong Ukyen Kelsang would serve as the first Chant Master. The monastery quickly became very popular and was the center of many activities for the Gelug tradition in Nepal. 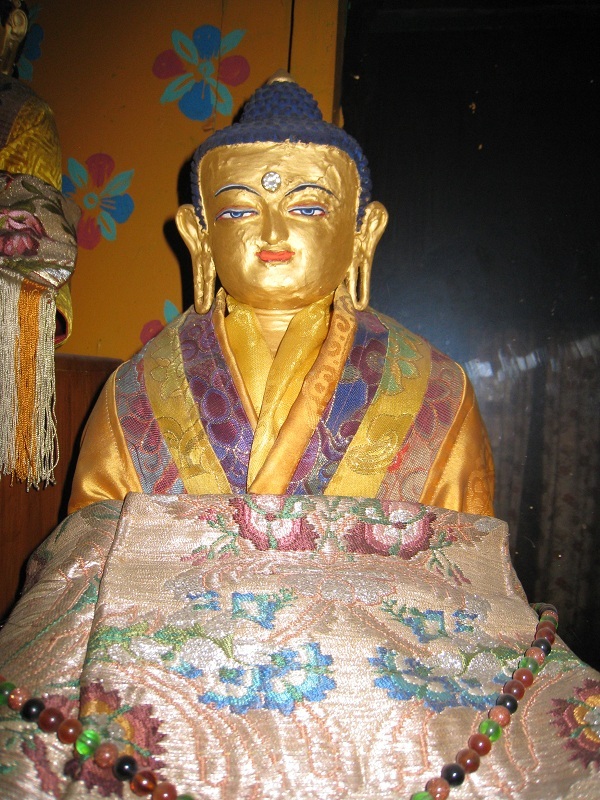 In 1991 the Phayul Gaden Monlam Festival was started by Kyabje Dagom Rinpoche at Phelgye Ling. Many thousands came for the celebrations. Nyanang Phelgye Ling continues to host the Phayul Gaden Monlam Festival at the begining of each new year. The current abbot of Phelgye Ling Monastery is Gelong Chodak, who has been the abbot for 2 years. Nyanang Phelgye Ling Monastery has hosted many esteemed Lamas over the years, who have giving Dharma teachings and transmissions to countless people who came to receive their blessings. Below is a list of some of the Spiritual Teachers who have bestowed these precious teachings. 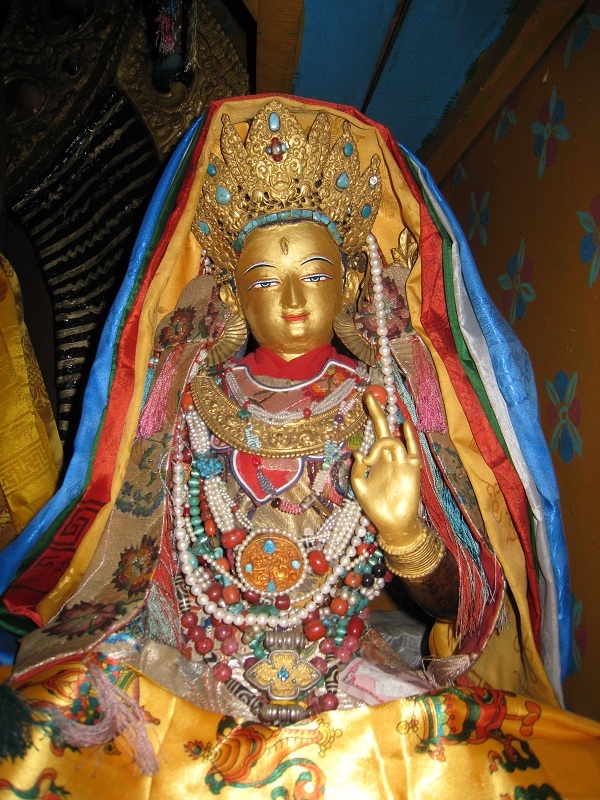 Khunu Lama Tenzin Gyaltsen – Teaching on Je Tsongkhapa’s text The Three Principal Paths. Kyabje Zemey Rinpoche - Teaching on Je Tsongkhapa’s text The Three Principal Paths, the Guru Puja, and Vajrayogini. Rinpoche also gave a commentary on Guhyasamaja, Chakrasamvara, and Yamantaka, as well as Empowerments for these deities. Panglung Rinpoche – Teachings on Je Tsongkhapa’s text Yunten Shigyuma ( The Source of all Good). 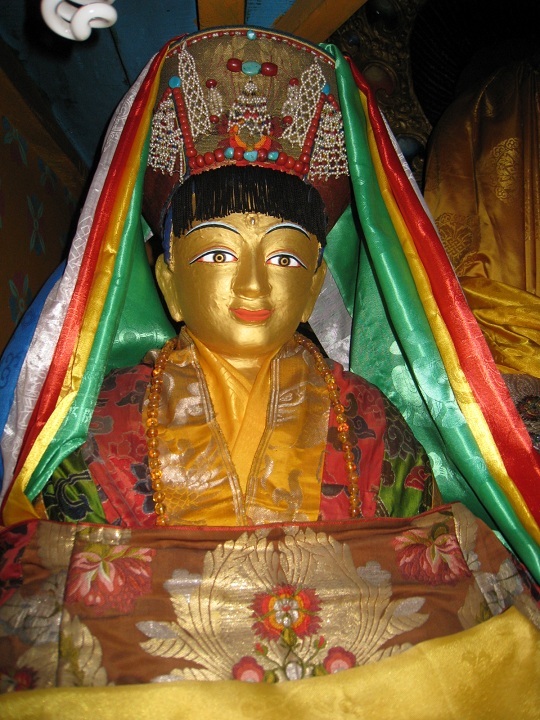 Pampar Rinpoche – Teachings on Je Tsongkhapa’s text The Three Principal Paths. Geshe Ysehe Wangchuk – Mahayana Sojong (Restoration and Purification Vows). Kyabje Dagom Dorje Chang - Teaching on Je Tsongkhapa’s text The Three Principal Paths, Lam Rim Chen Mo ( The Great Text on the Stages of the Path to Enlightenment), the Guru Puja, and Yamantaka; in addition to countless other teachings and transmissions. Kyabje Pabongkha Choktrul Dorje Chang – Presided as Monlam Tripa (Head of Ceremonies) during one of the first Phayul Gaden Monlam Festivals. Many others Buddhist Masters and scholars have visited Nyanang Phelgye Ling Monastery since its reestablishment in Nepal. Among these are the 16th Karmapa, Rangjung Rigpe Dorje and the current Sakya Trizin. Below are some of the precious items here at Nyanang Phelgye Ling Monastery that many people come to receive blessings from. 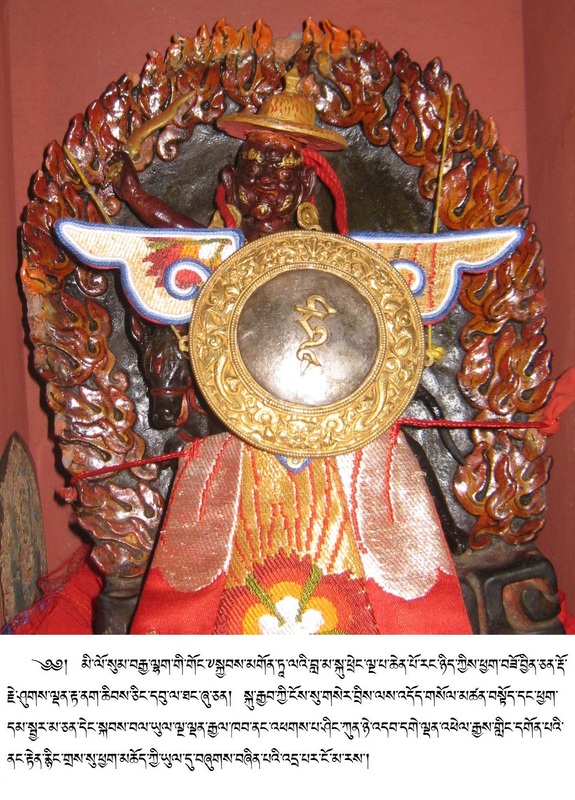 Below: Statue of Dharmapala Dorje Shugden made by the Fifth Dalai Lama. Below: Rare statue of Jetsun Milarepa (1052— 1135 CE) made during his lifetime by his heart-disciple Rechungpa. Below: A statue of Shakyamuni that is said to date back to the time of King Langdharma of Tibet, who reigned from 838 to 841 CE. King Langdharma is well known for his suppression of Buddhism and it is said that he ordered all statues to be destroyed unless the statue could prove its worthiness by actually speaking. This statue above is believed to be one of the statues that spoke directly to Langdharma, and thus was spared from destruction. Below: The famous Tara statue that spoke. This statue is famous throughout the Himalayan region due to its ability to speak to those with pure minds. Many have come to Phelgye Ling Monastery to behold this treasure and ask Arya Tara for her blessings.